Hello again, it has been a looooong week. You ever have one of those? Everything seemed to come out of nowhere and attack you from all sides. This week it has been a combination of more pain and my depression. Yuck!! I'm not sure if a lot of you know that I suffer from a condition called Degenerative Disc Disease plus a few other back ailments. And one thing that goes hand in hand with chronic pain is depression. So to sum it up I had a bad pain week so my depression was high too. What fun!! Well, enough of that, on to my post. challenge. This challenge was themed #170- Things That Fly. I knew a lot of people would choose the butterflies or the new dragonflies but I wanted something a little different. So I got out my Annual catalog and went through it page by page and made note of all the flying things. I finally decided on the flamingo from the Pop of Paradise stamp set. 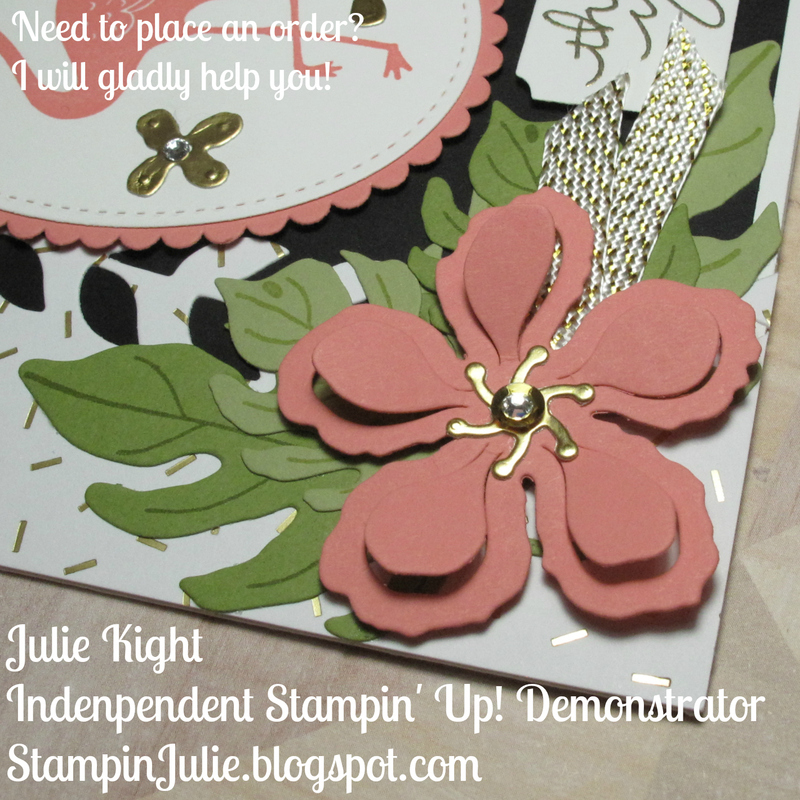 Next, came a card idea so I headed over to Pinterest and looked around. I picked and chose a few things and came up with my card. First, I made my card base by cutting an 8-1/2"x 11" piece of Whisper White cardstock in half to 5-1/2"x 8-1/2". Next, I folded one piece in half and I have my A2 card base of 4-1/4"x 5-1/2". Then, I took a piece of Basic Black and cut it to 4"x 5-1/4" and glued it on top of the Whisper White card base. I then wanted to use a piece of the gold specialty paper from the Pop of Pink DSP (Designer Series Paper) that I had on my desk on this card so I used the Botanical Builder Framelits and die cut the long leaf die on the edge of this paper. I glued it down along the edge of the card base. White. I die cut it out with my Stitched Shapes in the largest oval. 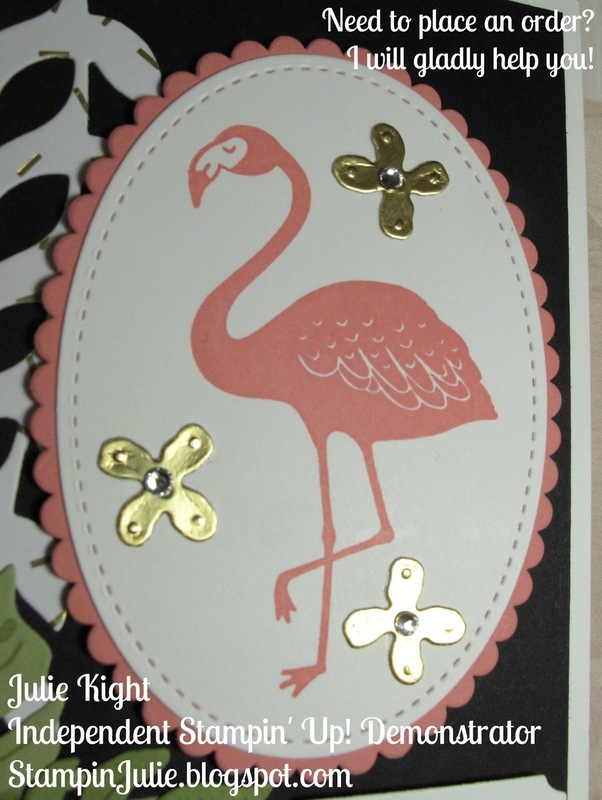 Then I die cut a scalloped oval in Flirty Flamingo cardstock using the Layering Ovals Framelits. And then I glued these two together. 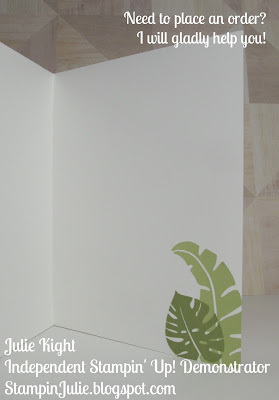 I wanted a little more on this piece so I got out my Gold Foil paper and die cut out three small flowers. I glued them onto the Flamingo piece and then placed rhinestones in the middle of each. 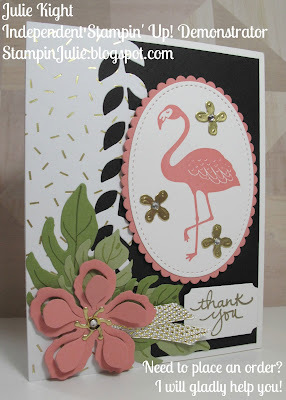 I put Stampin' Dimensionals on the back and placed this piece onto my card base. the flower. I die cut out a flower center using again the Gold Foil paper and glued it onto the flower. On top of that I glued down a gold sequin and then a rhinestone. I then cut a 3-1/2" piece of the Metallic Ribbon available only during Sale-a-Bration which ends March 31st! I folded this slightly off centered and used glue dots to tuck it under the flower. I couldn't leave the inside blank so I used the Pop of Paradise stamp set again and stamped the large leaf in Pear Pizzazz and the smaller leaf in Old Olive. I stamped them a little off the edge for a cool look. And there you have my card. 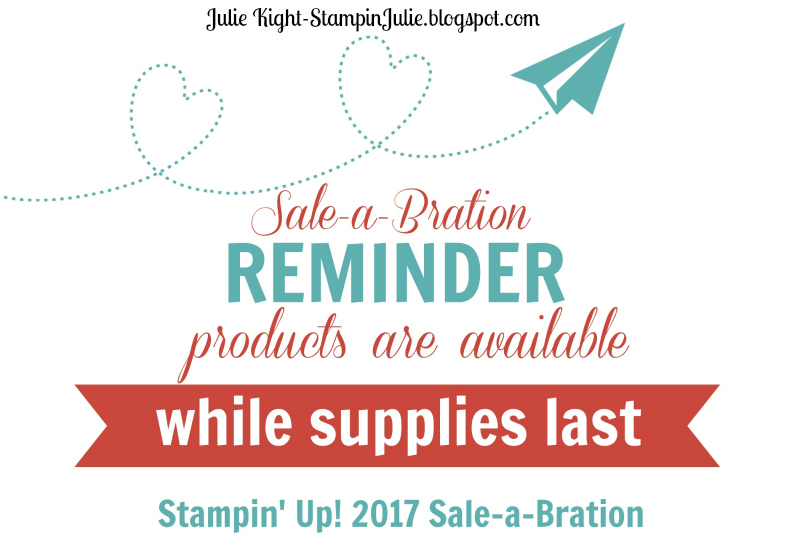 Only 13 days left for Sale-a-Bration! Brilliant thinking - yes the flamingo is a different choice but it's Just perfect for our flying challenge. So glad you joined the fun at SUO. Sorry it has been a rough week. Hope this one is better! Love the pink flamingo choice for your "flying" challenge card. So beautiful! Thanks for playing along with the SUO Challenge this time! Your card is amazing. The Botanical Flowers are so much fun to use. Thanks for playing along with the SUO Challenge. Oh this is just sooooo fun! Love all the little 'extras' you had have on there! Thanks for joining the SUO challenge!